Today is also World Down Syndrome Day that has been given full recognition by the United Nations! 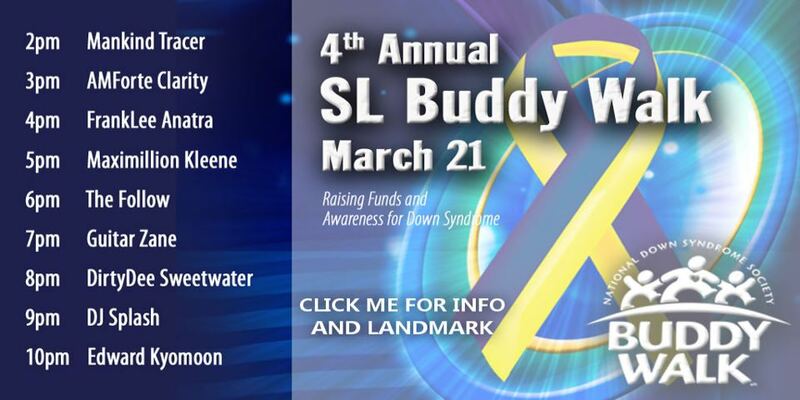 If you’re a member of Second Life, or want to join, please drop by the 4th Annual Buddy Walk® today from 2pm (PST) till 11pm (PST) that is located at the Palladium region simulator. All proceeds raised at this event go directly to the NDSS in the United States in helping them to give help to individuals with Down Syndrome so they have opportunities to reach their full potential in life! This entry was posted in Alternative Music, Digital DJ, DJ, Non-Profit, Second Life, Social Media and tagged Charity Event; DJ, Non-Profit, Second Life. Bookmark the permalink.